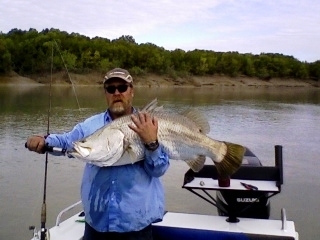 TESTIMONIAL: I catch too many fish with it! I catch too many fish with it! I purchased a Bar Crusher 610C (now 615C) in November last year. Attached are some photos of me and my two sons with some barra caught during the run-off early this year. The only thing wrong with my boat is I catch too many fish with it! This is the best boat I have ever owned and I always get good comments from other fishermen when I am on the water. I was at the mouth of the East Alligator River in a half to one metre chop and it just ate it at some speed. My friends that own similar size boats that were with me at the time could not believe it. I would like to thank you again for a great boat and the best customer service. I always recommend Bar Crusher boats to everyone.